I don't want to clutter up the Hoard thread to much so a bit of a WIP thread for this model. The Mechanical Master Mover was originally designed to assist the heavy lifting construction industries for the British empire with the building of large Metal structures and vehicles. The Mech itself was not the first designed to fill this role but it did bring a few unique features that have effectively made it the most commonly used construction/industrial mech. 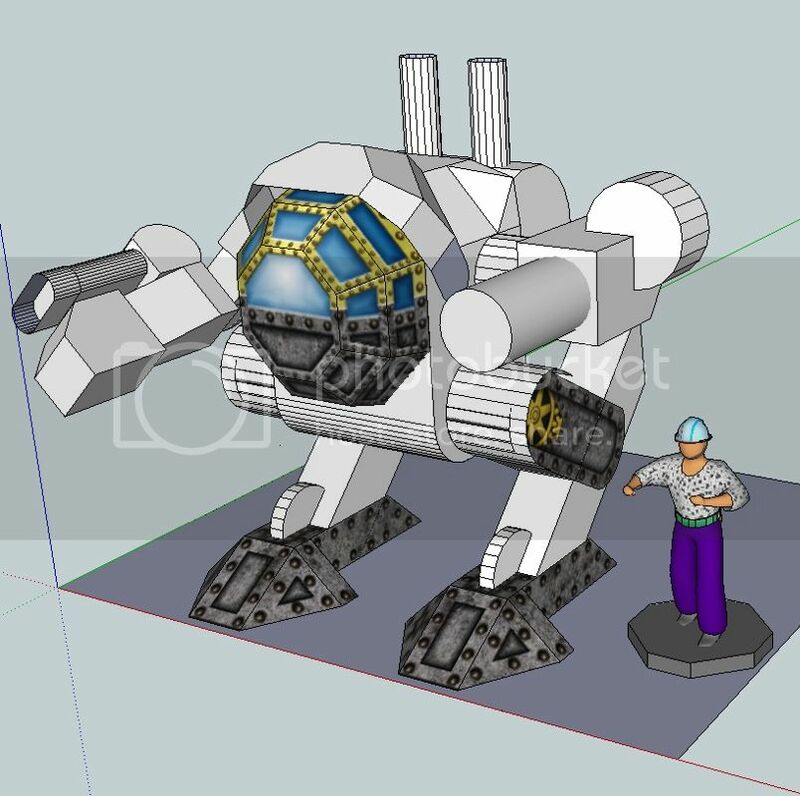 Size; the mech is noticeably smaller than all other construction/industry mechs currently available this small size enables it to enter and be used in a larger array of construction sites even to the extent of being used on large reinforced scaffolding during larger builds were other models cannot be deployed. The mech can also be easily manoeuvred through Freight doors and fit inside larger construction elevators. 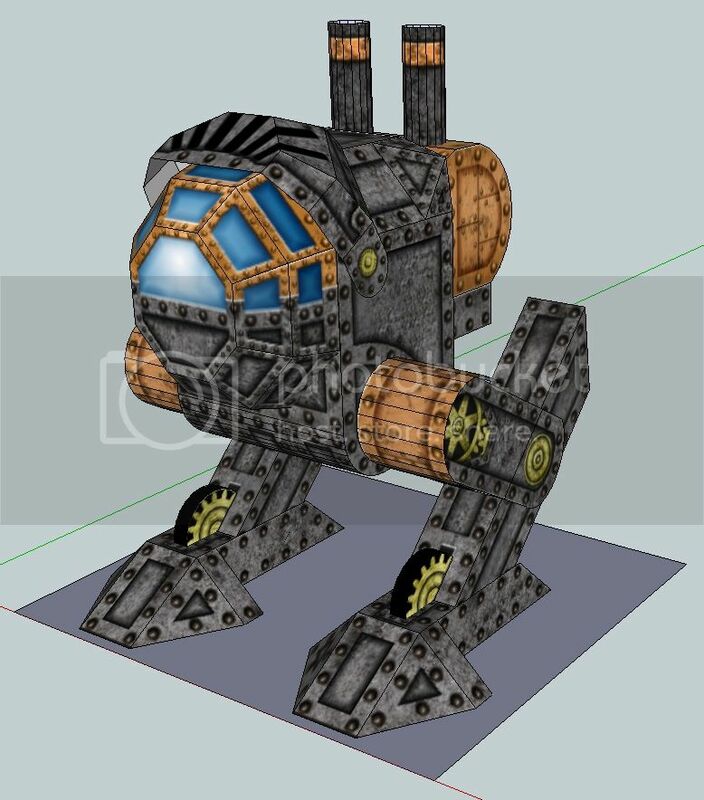 The triple cycle steam engine provides an excellent power to weight ratio with an ability to provide assists on projects were mechs 20% bigger are normally required. Articulated Hand(s) the mech comes with the very first articulated hand modules although only consisting of 3 fingers and a thumb this gives the Mechanical Master Mover a surprisingly large amount of dexterity and enables it to use equipment designed to be handled by 2-3 men with ease. Configurable arm attachments the mech has an array of easy fit hand attachments although not instantaneous to swap a knowledge Mechanical Master Mover technician can easily have a mech configured for a specialist duty within 60-120mins using one of the standardized hand/arm modules. This allows for a lower overall outlay for a company on base mech units although a slightly increased cost in specialized mechanics. The Mechanical Master Mover mech was first noticed by the British military during the attempted invasion of London by Prussia French , prior to this the Mechanical Master Mover had been dismissed as being too small to be effective on the battlefield. The Prussian forces French launched an all out assault on the city of London over 40,000 Troops as well as vehicles mecha and tanks were deployed from Ironclads which had broken through the Thames Barrier under the cover of darkness. The Local military forces were outnumbered and out equipped at a ratio of almost 4 to 1 and it seemed inevitable that London would fall (at least in the short term) to the Prussia, a significant moral blow if nothing else. The London construction and dock workers had other ideas with many jumping into their Mechanical Master Mover and starting a guerrilla campaign to harass the Prussian troops as they moved into the City. The narrow London streets turned out to be a nightmare for the larger mechanised walkers and tanks with the smaller Mechanical Master Mover often able to surprise or jump onto the larger units from warehouses in surprise smashing and bending weapons and carving into the vehicles before the Prussians could retaliate with any kind of coordinated attack. For 2 days the London defence force and the construction and dock workers in there Mechanical Master Mover harassed and basically stalled the Prussian attack until reinforcements could arrive. At that time the general of the Prussian army called a meeting with his British counterpart who to save further damage to London agreed the invasion force could depart unharrassed. At a very rough count the Prussians lost almost a quarter of their troops and larger heavy equipment some of which they were forced to leave behind. After this battle the military reviewed the Mechanical Master Mover and commissioned a military variant. Due to the utilitarian nature of the construction mech it was found to already be extremely durable with heavy thick plates to prevent damage during construction. The addition of a metal visor that can be lowered down in front of the main hardened glass window although capable of withstanding significant blows it was deemed as prudent to provide maximum protection for this area. 2 specialised modular gun systems in both a left and right side configuration; a short range and deadly 8 barrel Gatling gun and a larger long range (short muzzled variant) of the12-pounder Whitworth breechloading rifle 3 inch cannon. The Whiteworth only carries enough rounds for 8 shots before being depleted a secondary backup magazine of 8 shots is stored below the boiler on the back of the Mechanical Master Mover. It is very difficult for the Mechanical Master Mover to use the Whiteworth accurately on the move with most pilots preferring to stop and brace before firing and using the high accuracy of the Whiteworth Rifle like an infantryman sharpshooter. Unless surprising their opponent at close range were a miss is near impossible. Initial trials were disappointing as existing mecha pilots were used to simply walking up the middle of the battlefield absorbing hits. However several prototypes were issued to infantry divisions which used the mechs as simply over sized troops and the MMM's true capability started to show through. Will you be making claw hands or fists? Hand/Fist yep and it built okay, I have a claw designed but I didn't test build that as part of initial test build so it may end up getting scrapped as I'm a little worried it'll be to fiddly. Sheesh I always seriously underestimate how long texturing takes, even when you have all your base textures ready to go and a rough design idea still time consuming...I'd kill for a filter labelled "Fill steampunk rivets"
Temporarily hidden the weapons, almost got the first page texturing finished, but back to work tomorrow so I wont get to do much more until Xmas/Boxing day. Just the firebox, smoke stacks and armour triangles to go. The visor is only about halfway textured . Once there mainly done I might add a few surface details, pipes and some other options. 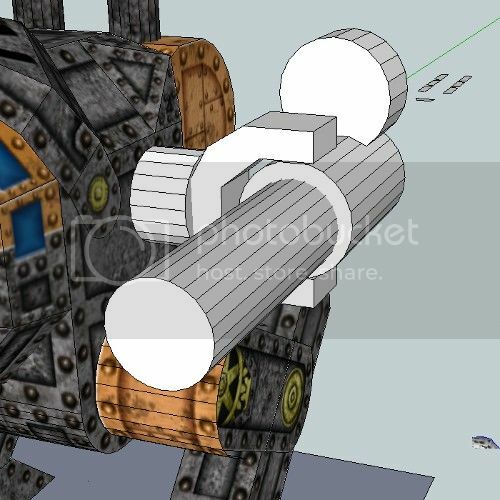 The small armour wraps around the top of the legs I'll do in Bronze Brass, Copper and Steel plates same with the boiler. Looks really good too, particularly the canopy work, I like the knight's visor hoody. Is the drop shadow and highlight on the left knee cover intentional? They look reversed to me. I've been finding the brass and copper textures difficult to work with in regards to sinking and raising bits, they tend to come out looking bowed or slightly rounded, which likewise does my head in when I look at them some of the time. Possibly darkening the middles will help so I'll give that a try . Finished up texturing the main body..okay i just noticed I missed 2 pieces of strapping but a quick fix. Squirmydad have fixed the issue with the knee or still look a bit wonky? Trimed out in copper. The boiler at the moment can be copper or steel no brass option. The hip/upper leg plates come in brass, copper or steel. The cockpit trim can be brass or copper same with the smoke stack trim. 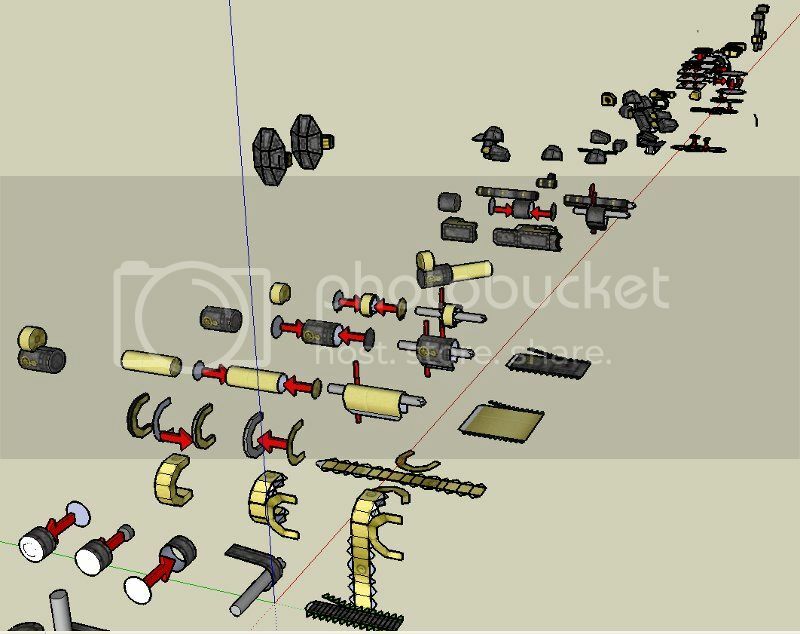 All the cogs and pivoty bits are only brass. I'm moving onto the weapons as I need to make some minor corrections to some sizes and dimensions. I'm not going for 100% historical accuracy but I want the weapons to be close enough to the real thing to not seem to oversized. Means some slight redesign and scaling but nothing major. I really like the proportions and the knight's visor shield over the canopy. Nice job! I've re-laid out the 2nd page and will start texturing the above two. they will take a little longer as I will stick brass cogs etc all around the place. 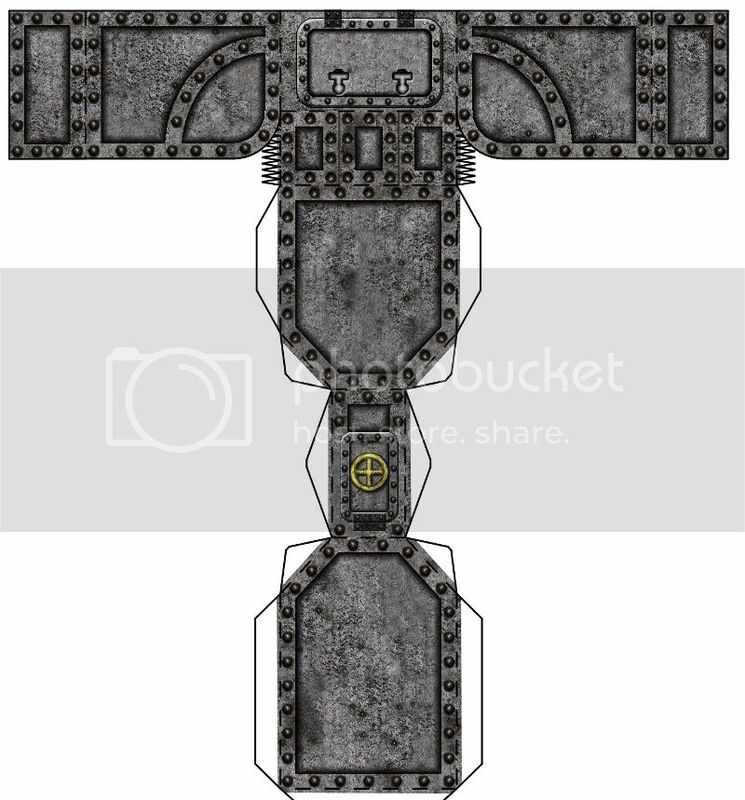 I did start work on a Tesla lightning gun but cant fit it on the page so I'll hold it back for a different model maybe a gun carriage then it will be possible to mix and match weapons between the mech and gun carriage. This really looks sweet. 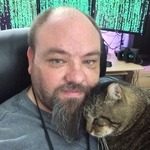 As far as fiddly connections, some of us like them, others don't. If you simplify, I will probably do my own mod. If you keep it detailed, those that like simple will mod it to their liking. Just build it the way you want, and we'll be happy. Weapon texturing done, Just brass and Metal option although the page will be mirrored so I can mount the weapons lefty or righty. Some of the weapons are less weapons and more industrial tools which can be used as makeshift weapons. Final test build next, which will result in some minor tweaks followed by final layout and instructions...so about 2/3rds done. Pretty stinking cool. Hmmm, concept, design and test-build in the time it would have taken me to build it. You, sir, are very good. I see that I can start making my rivets bigger, the larger ones on your mech give it a nice "chunky" look. This makes me want to re-ignite my Steampunk Fantasy setting. Thanks all for the encouragement and comments (here and FB) helps keep me focused on getting this wrapped up. I've cut and built the Gatling gun plus the complex pintal mount. I built it out 220gsm card...160gsm would have been plenty. So just about half done, no major bugs yet couple of minor tweaks. On with cutting out the cannon, saw blade, shield, hammer and flame thrower. I'm also playing around with magnets to allow the arms/hands to swap out easily working well so far and I'll include what I've done in the instructions . 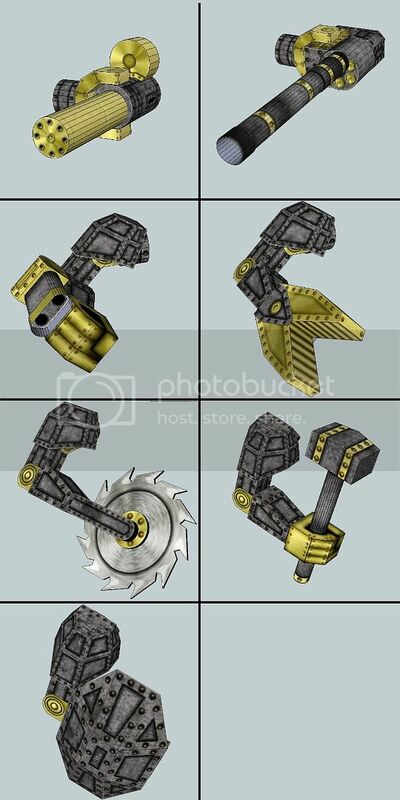 not really articulated, just lets you swap the modular hand weapons over without building a whole new model or remove the whole arm and mount a gatling gun/cannon or vice versa. I guess you'd call it the Beta test build finished. Few corrections to make, again nothing major, mainly an over abundance of glue tabs and the flamer shroud to fix. I'll also try and fit another extra hand on so the shield has a hand to glue to. THIS IS... JUST UNBELIEVABLE - SIMPLY REVELATION! Plus despite gorgeous model itself you've also added so many configuration possibilities - all those optional arms / weapons!!! WOW... ONE WORD - SPECTACULAR!!! I think I am the only one that people get on about all caps... But then again, I over-use it a little. I think that these are brilliant! 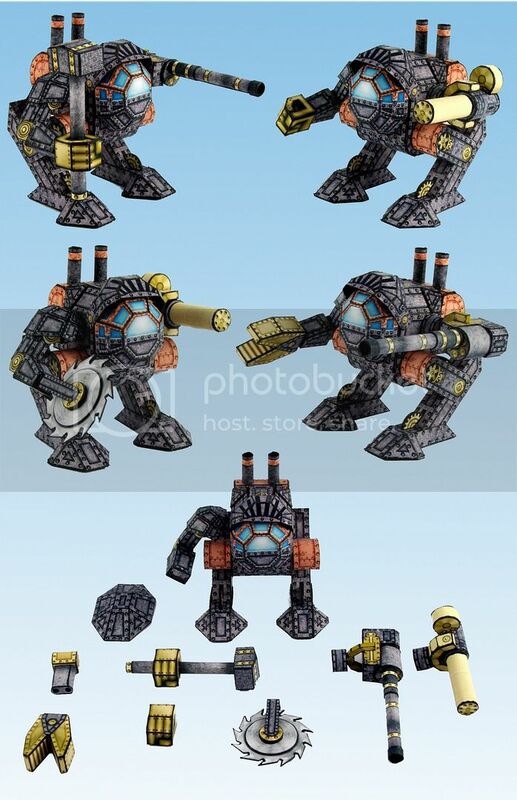 I mentioned on FB that these will see use in ERA OF WAR and possibly Robots of Mass Destruction! 1. there is a stop switch that stops the head from moving to far left as I face the machine, my robo would sometimes get lost and then it'd turn into a leftend grind-fest. 2. The drive belt is slightly heavier both wider, thicker and the belt grips slightly deeper and beefier. Bear in mind I had an old Robo not the SD so unsure if the Sd already had the above features. Pulling the blade out resulted in an unusable head there is a brass collar on the inside and the little clip on the new head. I managed to wangle the brass collar back in place but not sure I can get the little clip back..maybe better hobby electronic tweezers would let me do it. Anyways assuming you could get hold of just a new blade it would not be a simple matter of sliding a new one in it would be a rather fun game of put the tiny clip back on the tiny bar using a pair of tiny tweezers for an hour or so...so I'd hang onto the old robo/sd head as long as possible as the old head fits the new machine...well until a plethora of cheap third party heads arrive. this is one of the most beautiful things I have EVER seen!!!! !